Most work on hES cells has taken place with a relatively small number of cell lines obtained from excess blastocysts donated from in vitro fertilization (IVF) programs. The genetic makeup of the cells is not controlled in any way, and genetic variation among lines needs to be considered when results from different lines are compared. Experience from research with mES cells shows that ES cell lines can differ markedly in their differentiation efficiencies. Being able to control the genotype of ES cells would be valuable for various reasons, most notably the desire to generate ES cells with genotypes known to predispose to particular diseases. In the case of single-gene defects, one could achieve that goal by deriving hES cells from discarded morulae or blastocysts that were identified with preimplantation genetic diagnosis (PGD) procedures (Verlinsky et al, 2005) as carrying mutations or by generating the appropriate mutation by gene targeting of established hES cell lines. However, such approaches cannot be used if the genetic predisposition has an unknown basis or arises from multiple gene effects. Availability of hES cell lines from patients with Alzheimer's disease, type I diabetes, or many other complex diseases would provide a source of cells that could be differentiated into appropriate cell types; and the progression of the disease could then be modeled and potentially modified in culture. Given the complex interplay between genotype and environment that typifies complex chronic diseases, the availability of cell-line models would provide major new tools for diagnosis and therapy. In this context, hES cells are research tools for the study of disease, not therapeutic agents themselves. Controlling the genotype of ES cells will also be important in the future if they are to be used directly as therapeutic tools in regenerative medicine. Transplantation of hES cells will face issues of tissue rejection common to all forms of organ or tissue transplants. As in organ or bone marrow transplantation, one solution is to develop large banks of genetically diverse hES cells to increase the chances that matches can be found for all patients who need them. That is one strong medical reason for generating additional hES cell lines from a wider spectrum of the population. Other methods to overcome tissue rejection, including genetic modification of hES cells to reduce immunogenicity and use of immunosuppressive drugs may be helpful. However, in the long run, one obvious solution would be autologous transplantation, using hES cells genetically identical with the recipient of the graft. Generation of ES cells using nuclear transfer (NT) has the potential to produce ES cells of defined genotype to address both genetic diversity and avoidance of rejection. NT is the process by which the DNA-containing nucleus of any specialized cell (except eggs and sperm, which contain only half the DNA present in other cells) is transferred into an oocyte whose own nuclear genome has been removed (Figure 2.2). The egg can then be activated to develop and will divide to form a blastocyst, whose genetic material and genetically determined traits are identical with those of the donor of the specialized cell, not those of the donor of the oocyte. The oocyte does provide a very small amount of genetic information in the mitochondria, the "energy factories" of the cell, but the genes in the nucleus are of overriding importance, nuclear genes being responsible for the vast majority of the traits of the animal. If such a blastocyst were transferred to a uterus, the transferred blastocyst could potentially develop into a live-born offspring—a clone of the nuclear donor. NT was first developed with frog embryos and later successfully used to generate Dolly the sheep, the first mammal cloned from an adult cell (Campbell et al., 1996). Since the birth of Dolly, live cloned offspring of several other mammalian species have been reported, including mice, goats, pigs, rats, cats, and cows. The success rate of live births is very low, however, and a variety of abnormalities have been found in cloned animals (NRC, 2002b), so this is currently an unreliable technology and unsafe for application to humans. Given the safety issues associated with NT for human reproduction, there is a worldwide consensus that such efforts should be not be conducted at this time. Despite some well-publicized but undocumented claims of production of live cloned babies, the scientific community in general and this committee in particular support that moratorium. FIGURE 2.2 Comparison of Normal Preimplantation Development with Nuclear Transfer (NT). 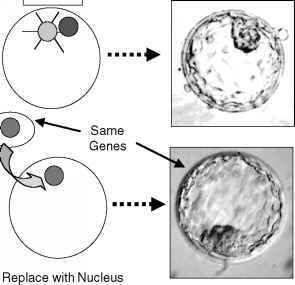 In NT, the genetic material of the oocyte is removed and replaced with a diploid nucleus from a somatic (body) cell. This divides to yield an NT blastocyst whose genes are identical with those of the donor somatic cell. NT blastocysts, like normal blastocysts, can be used to derive embryonic stem cells from their inner cell masses. The picture shown is of a normal human blastocyst (http://www.fosep.org/images/blastocyst2.gif) because pictures of human NT blastocysts are scarce and normal and NT blastocysts appear indistinguishable. mouse (Rideout et al., 2002). Although production of normal live offspring from NT blastocysts is not very successful in any species, NT ES cells seem to be able to differentiate normally in mice and have been able to contribute extensively to adult tissues, including the germ line, in chimeras (Wakayama et al., 2001). The rate of successful production of ES cells from NT-derived blastocysts is, however, still quite low (less than 5 percent). over 200 oocytes were used in the course of the experiments that generated a single line. However, the scientists made a number of improvements in the procedure as the experiments progressed, increasing the yield of blastocysts and suggesting that the success rate will be improved in the future. This proof of the principles behind generating NT hES cells has made plausible the derivation of more such lines from specifically defined genetic backgrounds. It is important to note that stem cells made using NT result from an asexual process that does not involve the generation of a novel combination of genes from two "parents." In this sense, it may be more acceptable to some than the creation of blastocysts for research purposes by IVF (NIH HERP, 1994). It has also been suggested (Hurlbut, 2004) that transfer of genetically altered nuclei incapable of directing full development might make NT acceptable. However, it has been pointed out (Melton et al., 2004) that this approach faces many technical hurdles and does not avoid the need for oocyte donation. At least three methods for generating hES cells from defective embryos have been suggested. One such method involves the use of viable blastomeres extracted from a morula or blastocyst that has been declared dead due to cleavage arrest (Landry and Zucker, 2004). This proposal is untested and is technically challenging. Even if it were possible to identify unequivocally embryos with no chance of further development, the likelihood of then isolating a viable blastomere and generating an ES line is small. There has been only one published report claiming derivation of mES cell lines from isolated 8-cell blas-tomeres (Delhaise et al., 1996). One cell line was obtained from 52 fully viable, dissociated 8-cell stage morulae. Two other methods of generating hES cells from defective embryos have been considered: parthenogenesis and androgenesis. 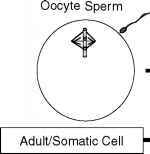 In parthenogenesis, an oocyte can be activated to develop without being fertilized by a sperm. The genomic DNA of the resulting embryo is completely maternally derived, which is not compatible with survival to term. Both mouse and nonhuman primate parthenogenetic ES cell lines have been established (Kaufman et al., 1983; Cibelli et al., 2002). The results are of interest because deriving stem cells from parthenogenetic blastocysts could eliminate the requirement to produce and destroy viable blastocysts. Parthenogenetic ES cells could serve as an alternative source for autologous cell therapy. However, parthenogenetic mES cells show restricted tissue contributions in chimeras and in teratomas formed by grafting the cells under the kidney capsule (Allen et al., 1994); this is related to the lack of expression of key imprinted genes that are normally expressed from the paternal genome. In contrast with parthenogenesis, in androgen-esis the entire genome comes from the male parent. Such embryos also do not survive to term. Diploid androgenetic mES cells have been derived (Mann et al., 1990), but many androgenetic ES cell chimeras died at early postnatal stages, and the ones that survived developed skeletal abnormalities. Again, the imprinting status of the cells differed from that of wild-type ES cells (Szabo et al, 1994). Thus, although the results show that androgenetic and parthenogenetic ES cells have broad developmental potential, their imprinted gene expression status is likely to restrict their therapeutic applications. Moreover, no human parthenogenetic or androgenetic stem cell lines have been established, and more research is needed to determine whether these techniques can be applied to human oocytes for production of stem cell lines.